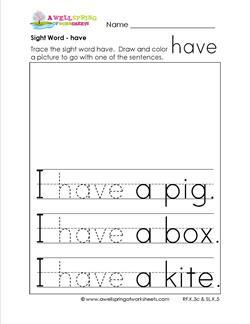 Each of these sight word practice worksheets zeros in on one sight word and uses it in three very short sentences. First, children read the sentences. 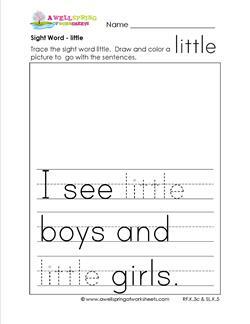 Second, they trace the sight word neatly on the primary writing lines. Last, they choose one of the sentences and draw a picture to go with it. They might be able to incorporate all the sentences into one picture. You can reinforce the concept of how words are put together make sentences. Ta Da! Introducing the sight word a. Trace the word a. Read the sentences: I see a bug. I see a fan. I see a map. 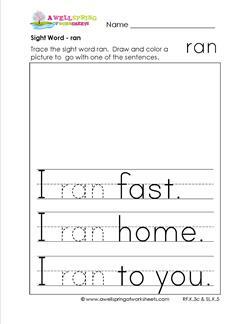 Draw and color a picture to go with one of the sentences. 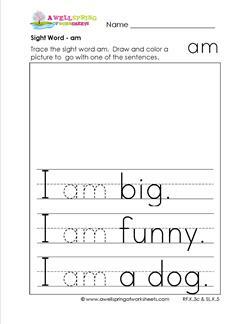 The sight word am is the star of the show in this worksheet. The three sentences included: I am big. I am funny. I am a dog. Draw a picture to go with the sentences. 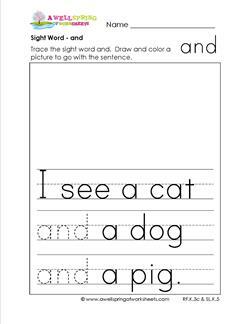 Using the sight word and is easy-sneeezy especially when making lists like the sentence in this worksheet: I see a cat and dog and a pig. Draw a picture to go with the sentence. The sight word are used in these sentences sounds like a day at the beach or the pool: We are hot. We are wet. We are tan. Trace the word are, read the sentences, draw a picture. My dear little friend, where in this big wide world are you? 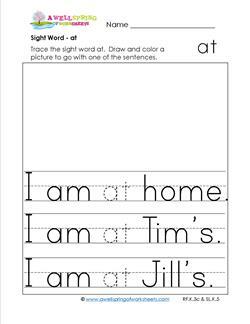 Practice tracing the sight word at with these three answers: I am at home. I am at Tim's. I am at Jill's. Draw a picture. 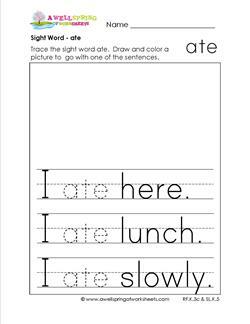 The sight word ate refers to lunch in this worksheet: I ate here. I ate lunch. I ate slowly. Trace the word ate, read the sentences, and draw a picture of yourself eating lunch! 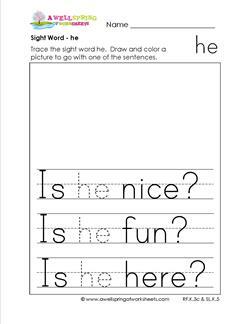 The sentences in this worksheet sound like it's the perfect place to draw a big happy face! The sight word be is used to make the sentences: Be kind. Be good. Be happy. I can go. I can run. I can jump. 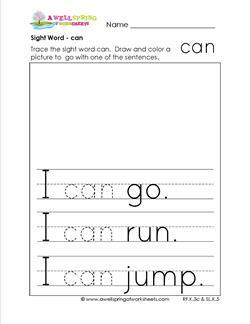 As you read these sentences with the sight word can you envision an active child! Trace the word can, read the sentences, and draw a fun picture. 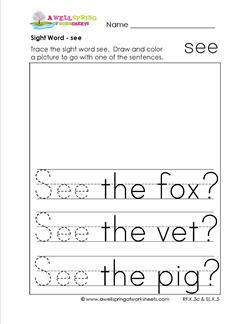 Trace the sight word come then use your imagination to draw a picture to go with the sentences. I come here. I come now. I come see. What could it be that you've come to see? 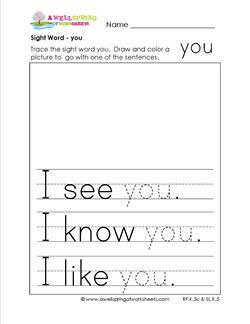 Trace the sight word for in the three following sentences: It is for me. It is for you. It is for us! What could "it" be? Read the sentences then draw a picture of the surprise! The sentences for the sight word go make us wonder where you could be going. 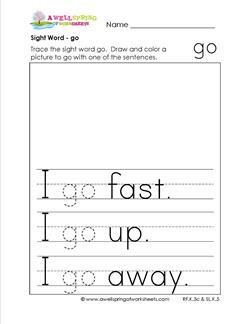 Read the sentences - I go fast. I go up. I go away. Trace the word go, then draw a picture to go with it. I have a pig. I have a box. I have a kite. Trace the sight word have and read the sentences. Color a picture showing the thing that you have. Is it a big pig, a tiny a box, or a high-flying kite? Is he nice? Is he fun? Is he here? Who could this mystery person be in the sentences with the sight word he? 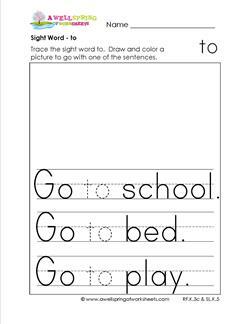 Read the sentences, trace the sight word, and draw a picture! It's a good thing to ask for help when you need it. I need help. Please help! You help me. These three sentences use the sight word help. What might you have gotten help with? It's always better to be somewhere together rather than being alone. Trace the sight word here. 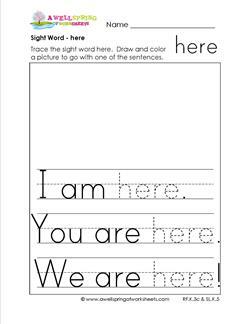 Read and draw a picture of the sentences: I am here. You are here. We are here! Trace the sight word I. Read the sentences and color a picture of one or more of the things you see. I see a cat. I see a dog. I see a toy. What do you do when you see them? Play with them? He is a boy. He is happy. He is nice. 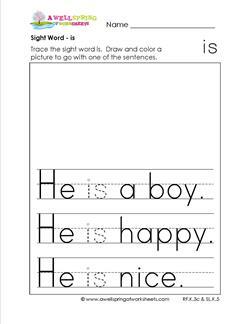 After reading these sentences, trace the sight word is and draw a cute picture of this happy little chap. Is he a friend, or a monster in your closet? Holy jumping bugs! I jump. I jump up. I jump high. Trace the sight word jump in these bouncy sentences. 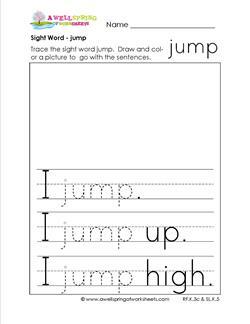 Read the sentences and draw a picture of yourself jumping. Boing! Boing! 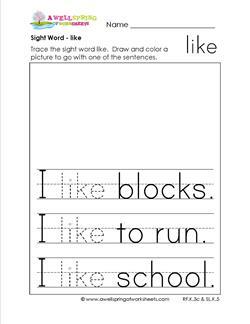 Trace the sight word like as you read these likable sentences: I like blocks. I like to run. I like school. Kindergarten is especially the best! Draw a picture to go with the sentences. I see little boys and little girls. Little munchkins everywhere..sounds like a kindergarten class! Trace the sight word little and draw cute a picture to go with the sentence. Feel the enthusiasm in these sentences? Look at me! Look out! Look up! 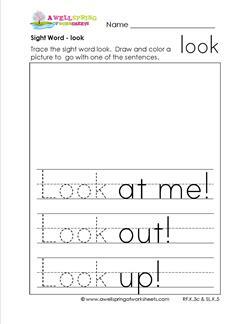 Read the sentences and trace the sight word look. Color an exciting picture to go with them. 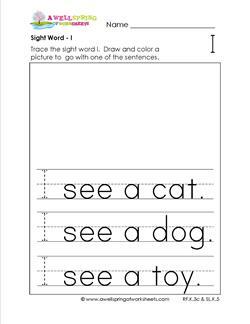 Trace the sight word me in each of the sentences on this worksheet. He sees me. He finds me. He likes me. Read the words and then draw a picture to go with the sentences. 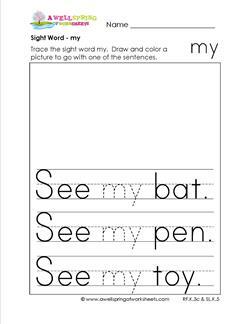 The sentences on this worksheet: I see my bat. I see my pen. I see my toy. Trace the sight word my and read each sentence. Color a picture of a bat, a pen, a toy...or all three! What child doesn't like to play? I play nicely. I play hard. I play today. 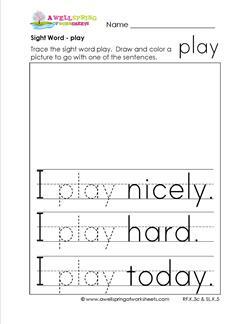 Read these sentences and trace the sight word play. Draw a picture of yourself playing alone or with friends. I ran fast. I ran home. I ran to you. These sentences with the sight word ran sound like the ending to a great movie! Trace the words, read the sentences, and draw a picture. I run away. I run now. I run fast. Sounds like kids playing at recess! Read the sentences and trace the sight word run. Draw a picture of yourself running like lightening. Unlike our other work- sheets, this one uses quotation marks. He said, "Hi!" He said, "No!" He said, "Go!" Read the sentences. Trace the sight word said. Draw a picture. See the fox? See the vet? See the pig? These sentences with the sight word see all end in question marks. 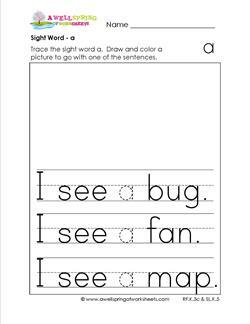 Read the sentences, trace the sight words, and color a picture. She is fun. She is tan. She is wet. Sounds like a good time with this mystery girl. 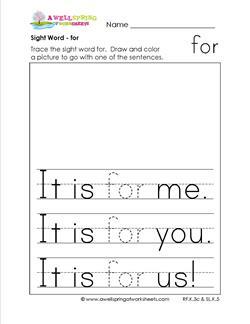 Read the sentences, trace the sight word she, and draw a picture. Is this girl you or a friend? The word the is the most used word. 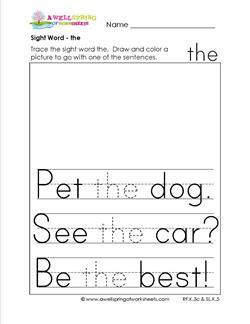 The three sentences using the word the are: Pet the dog. See the car? and Be the best! Draw a picture to go with one of the sentences. Read the sentences: I go to school. I go to bed. I go to play. Trace the sight word to. Draw a picture of yourself. Will you be pictured learning, sleeping, or playing? It's a mystery! 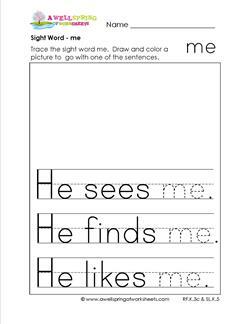 You can draw a picture of a friend for this worksheet. Read the sentences: I see you. I know you. I like you. 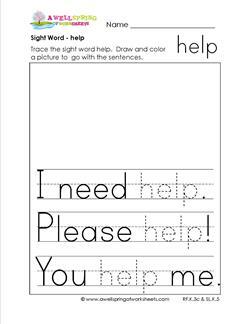 Trace the sight word you on the dashed lines and draw your subject.